Pieris is an evergreen shrub of Japan, China, and America. Their effect is precious among Magnolias, Rhododendrons, and the choicer evergreen shrubs, and the same soil usually suits them. They may also be grouped as bold rock garden shrubs in moist peaty or leafy soils, thriving all the better for partial shade at mid-day. The growth of these shrubs is slow, but not difficult. Cuttings from forced plants root most readily, those made from ripened shoots in August taking many months to start in a greenhouse; the same applies to layers, so that these ways are seldom used, except to increase fine seedlings. Seeds ripen freely, and should be treated like those of Azaleas and Rhododendrons. 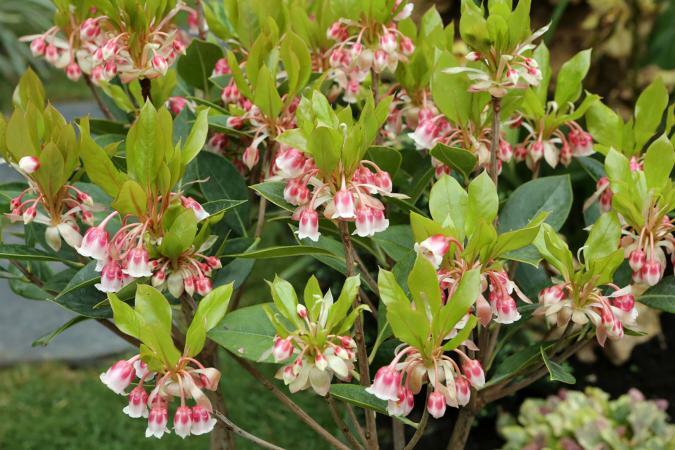 Pieris Floribunda - A close-growing evergreen shrub from N. America, with narrow oblong leaves and white urn-shape flowers in dense one-sided racemes, formed in the autumn and opening in spring. They will do so much earlier, however, and come much whiter too, if put in gentle heat under glass, or even cut and placed in water in a warm room. The plant is hardy in most soils, but thrives best in those of a sandy and leafy nature. It never grows high, and may be grouped with the choicer evergreen shrubs. Pieris Formosa - A beautiful and tall evergreen shrub, only hardy in the west and south of England, suffering injury at times even in the Thames Valley. It bears dark green leathery leaves, finely toothed at the edges, and drooping clusters of white bells, 6 inches in length, expanding in April and May. Nepaul. Pieris Japonica - A beautiful evergreen shrub with long drooping clusters of white flowers, giving almost a lace-like effect to freely flowered plants. It is hardy, and grows much larger than floribunda, but is slow and poor on cold or loamy soils, and only luxuriant in peaty or leaf beds that are well drained and free from lime. It will grow in shade and in full sun, but a moist half-shaded place is what it likes best. The flowers open from January to March, according to season, and last a long time, whether cut or in the open air. There are some dwarf garden forms, and one with variegated leaves. Japan.